Buddy (Clark) is an alien from another world. Imagine a cross between Tony Robbins, Dr. Oz, Dr. Phil, James Brolin, Jesus, and Superman. Buddy is sent by his father to earth to find and eliminate “great evil”. After looking around and asking people if they know where he can find great evil, he finds his niche in a skid row “reading room” where he puts his psychology skills to work. While simultaneously wooing the lovely Lora (Saunders), he also runs afoul of the personification of great evil - a pimp named Mr. One (De Morton). So while Buddy is transforming the mean streets of L.A. by turning gangbangers into devoted bookworms, Mr. One is trying to undo his handiwork - and he has a lot of cops and politicians right where he wants them. Naturally this leads to the ultimate showdown - will this ALIEN WARRIOR be the KING OF THE STREETS? (hey, I had to at least try to use both of the film’s titles). 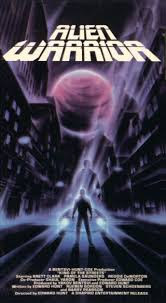 Alien Warrior (we prefer the alternate title of King of the Streets, as it’s more in keeping with the tone of our site) is an 80’s gem that is well worth seeking out. Its sheer ridiculousness never fails to totally entertain. While it might not be quite at the level of a Miami Connection (1987), Samurai Cop (1991), Geteven (1993), or Deadly Prey (1987), it’s damn close. Think of it as a second-round draft pick if they were forming teams of absurd, silly movies that you just have to love. The movie seems to be the end result of someone musing, “Man, I love that Paul Kersey character from Death Wish. You know the one thing that would make Paul Kersey better? If he was an ALIEN.” And that’s the good news - don’t be scared off by any supposed “sci-fi” overtones, as there is minimal sci-fi. What you do get are not one but two wacky alleyway fights, a bunch of blow-ups, shooting, racism, and adult sleaziness blithely mixed with childlike good-natured comedy. There are plenty of genuine laugh out loud moments, but we’re not sure if they were intentional. But it doesn’t matter. Alien Warrior is 80’s video store fun at its best. Brett Baxter Clark seemingly gives his all to the role, and perhaps delivers the performance of his career - though to be fair we haven’t seen every movie of his, of course, but this towers over his roles in Delta Force Commando (1988) and even Shootfighter II (1995). It seems Clark really was on board with this bizarre mix of pop psychology, community improvement, and senseless violence. Let’s not forget that he transports himself to earth using the power of his naked chest, and when he uses his healing powers to help a girl dying in the hospital, he implores her to “feel my beard”. We don’t think it’s a spoiler to indicate that she makes a full recovery. And that’s just the tip of the iceberg as far as the nonsensical pleasures Alien Warrior will provide for you if you give it a chance. We’d list more to entice you, but we don’t want to spoil it for you. In the end, Alien Warrior will appeal most to 80’s fans (there are arcades, breakdancing, and synths on the soundtrack), and people with a taste for the silly and absurd. As of this writing there is no DVD or Blu-Ray release, but there really should be. See it if you can.